The lately questioned, if also maligned, Bulls bench had some answers Saturday. And to the biggest one of “Where’s Marco?” it came with three consecutive three pointers early in the fourth quarter to give the Bulls enough space to hang on for an 87-80 victory over the Minnesota Timberwolves. And it may have to be… uugghhhh, wait, did he said Marquis? Yes, the rookie Teague handled himself reasonably well in six minutes, and we may be seeing more of him these next few games. That’s because—big, uh oh here—Kirk Hinrich left the game in the second quarter and did not return after a strain/sprain of either his hip, hamstring or gluteus maximus, that being either the Roman emperor with the gall to conquer Gaul or where the hip bone is connected to the foot of Italy. In any case, it didn’t sound all that good and could mean the Bulls with be flying Air Nate for a while. The Bulls reserves were vital in the win to go to 4-2 with Boston Monday the final home game until Nov. 26. The reserves scored 40 of the team’s 87 points and hit four of the team’s six threes as the league’s poorest three point shooting team finally broke out a bit with six of 13. Hinrich was to get further testing Sunday, but he missed a pair of preseason games when he had what was called a groin “tweak” in October. Given the Bulls relative lack of depth at point guard with Derrick Rose out, the Bulls have been cautious and conservative with Hinrich in playing time and recuperation. So it could be more Nate, who played twins again Saturday, both Good Nate and Bad Nate. 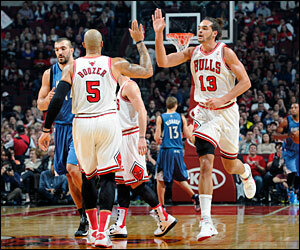 Like in the first half when Robinson had a team high matching Joakim Noah with 11 points as the Bulls trailed 41-40. But Robinson dribbled around on his own a lot, didn’t have an assist and committed five turnovers. But give him credit. He doesn’t run from responsibility. Or just about any shot. Nate kind of remedied it by mostly not passing to anyone. He did pick up a pair of assists somewhere. But he shot the ball well and his individual play, while not necessarily pleasing to the purist, is something this offensively challenged Bulls team needs. Without Rose, there aren’t many players on the team who can manufacture a basket. Nate can do that. It won’t go down in many coaching manuals, but the Bulls will take the points any way they can. And Nate can help. It was pretty much the usual way with pretty good defense. I wouldn’t call it great as the Timberwolves feasted on Robinson in the pick and roll. Actually, the Bulls pick and roll coverage hasn’t been very good overall this season. Though that’s understandable with so many new players being worked into the defensive system. But the Bulls do so many things well on defense, getting back in transition, contesting and playing so physical they left Luke Ridnour crying for his binky afterward. The play in which Budinger twisted his knee and had to leave actually came when Belinelli, hardly the next Laimbeer, bumped into Budinger and Budinger fell. Right afterward, the petite Ridnour got into a little pushing thing with Noah, who seemed to be flicking his jersey like he felt a bug flew into him. Noah was very good again with 17 points, seven rebounds (four offensive) and four blocks, including two on one sequence early in the fourth quarter when he blocked Greg Stiemsma and then recovered and got Alexey Shved. Yes, he’s an NBA player, too. The Bulls got 16 points and seven rebounds in an effective performance from Luol Deng and another good shooting night from Richard Hamilton with 12 points and two of three three pointers. It was a tough game offensively for Carlos Boozer, who had just two points and failed to score a field goal for the first time since his second year in the NBA in 2003. But I didn’t think Boozer played badly. It’s tough to score 20 with five shots. Boozer had nine rebounds, four assists and three steals, and he had a plus-5 in the plus/minus stats. Though I’m not a big fan of that measure, only Noah and Deng had better marks in Saturday’s game. And as they say in the playground, he had his man. Boozer mostly was defending Derrick Williams, the No. 2 overall pick in the 2011 draft, who shot zero for 10 and had two points. Minnesota has done a nice job with some low draft and free agency pickups. They just better trade their lottery picks. Boozer has had a rough last four games, but after playing through him often in the first few games, the Bulls offense has mostly stayed away. Which makes scoring more difficult. Hinrich also was without a field goal in 11 minutes before he left. Which left it to the bench that had been having some erratic times under what is lately somewhat unreasonable scrutiny. The bench group of the last two seasons seems to have taken on mythological proportions of the Pegasus or the Celtics bench of the 60’s with three or four Hall of Famers. The reserves have been fumbling some of their quarters of late, including in the Thursday loss to Oklahoma City, though Kevin Durant looked like he could have scored 50 if he felt like or Russell Westbrook realized he was on the same team. Nevertheless, the reserves took a bit of a beating. But they came out of it nicely Saturday with Robinson’s pinch hitting appearance for Hinrich and Belinelli answering the bell. The Italian Stallion (oops, that’s Rocky) came into Saturday’s game off playing just under six minutes Thursday. But after a quiet first three quarters with the Bulls entering the fourth leading 63-59, Belinelli hit a pull up three over a screen from Mohammed, a spotup with Deng finding him cross court and then Mohammed grabbing an offensive rebound in his best game yet as a Bull and pitching out to Belinelli on top for a three. That surge in less than two minutes enabled the Bulls to take a 72-63 lead with about nine minutes left and hold off a fairly effective Minnesota zone down the stretch for the victory. Minnesota had hardly anybody, though they came in 4-1 and unlike most of the last few decades of Minnesota basketball it was a team that actually believed it had the right to win games. There doesn’t seem much there without Love, et al. But Rick Adelman is one of the top coaches and Andrei Kirilenko has been one of the best offseason free agent pickups. He had another double/double while burly center Nikola Pekovic, one of the more underrated players, banged around for a team high 18. Dante Cunningham came off the bench as an inferno, hitting seven of 12 shots for 14 points to keep it close. The Bulls started well again as Noah got the team off to a 12-6 edge with a driving slam and another on a nice inside bounce pass from Boozer. Hamilton also was hitting, though Robinson had a brutal start, coming in and dribbling out the clock and then shooting an air ball. He did miss his first four shots as the Bulls led 20-19 after one. But he is a streak shooter, and you have to accept runs like that with those kinds of players. Thibodeau does tend to have a quick hook with mistakes, but he has tended to give Robinson some room. With Hinrich going out he had to, though Teague came in, got his first NBA basket at the end of the half and seemed to play with confidence. The Bulls ran into an 0-12 drought in that second quarter in Nate’s World, though he broke the run with a finger roll while the Bulls kept the Timberwolves from scoring. Noah and Gibson also continued to work together well as Noah found Gibson for a slam dunk and 31-25 lead before Minnesota began to find a soft pick and roll coverage and took that 41-40 halftime lead. Yes, they mostly seem ugly this season. Though like your children, none of them really are given the Bulls’ effort that goes into these games. Noah threw in a nice running hook early in the third, though the big men stepping up in the pick and roll coverage hurt as the Minnesota big men got to the basket and the Timberwolves stayed within four after three. But Belinelli with 11 for the game gave the Bulls that room and boost with the three jamboree, Noah had those blocks, Deng has a pair of scores in a row with a followup and driving layup and it was just enough to avoid one of those rare two-game losing streaks.